The Baking Steel Griddle combines the Original Baking Steel with a stove top Griddle. The Griddle is a 18"x14"x3/8" slab of steel that functions exactly like the Original Baking Steel on one side with an additional polished service and grease channel on the opposite side. This versatile product can go right in your oven to bake the perfect pizza on the textured side, serving as a traditional Baking Steel. When flipped over, the Griddle can be placed directly on your stove top to cook a variety of dishes from eggs, to burgers, to English muffins. The Griddle is a 18"x14"x3/8" a slab of steel that functions exactly like the Original Baking Steel on one side with an additional polished service and grease channel on the other side. It will turn your standard home oven into an industrial powerhouse by reaching temperatures higher than 700 degrees Fahrenheit, perfect for searing and baking, but can still handle lower temperatures for more delicate recipes, such as eggs and pancakes on the stove. Traditional cookware, such as a pizza stone or an aluminum griddle heat up just as quickly as steel, but do not conduct heat as efficiently. Baking Steel differentiates from other kitchen products due to its ability to distribute heat more evenly, providing an overall hotter surface. Thick-gauge steel and high volumetric heat capacity allow the Baking Steel Griddle to contain unparalleled amounts of energy long after the heat-source is turned off. 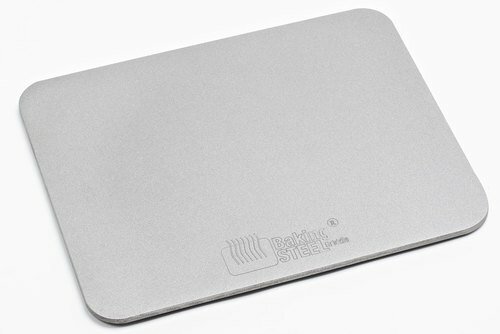 The Baking Steel Griddle is going to change the way people cook at home. Proudly manufactured in the USA. If you have any questions about this product by Baking Steel, contact us by completing and submitting the form below. If you are looking for a specif part number, please include it with your message.